Narragansett Park was located on the the Pawtucket, East Providence boarder. It was six miles from Providence and thirty six miles from Boston. It was a glass enclosed facility with the seating capacity of 15,500. 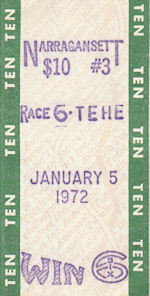 The grandstand sat 10,000, the clubhouse 5,500 which included in the turf club, that held 1,500. Track was a 1 mile dirt oval and the stables could accommodate 1,200 horses. It has been many years since Jim Hannon sat high atop the Gansett grandstand calling the daily feature race on WHIL. It's probably a long time since that radio station existed too. By 1978 Narragansett Park was terminally ill and on it's deathbed, but it wasn't always like that. In 1934 politicians, looking for ways to generate revenues, and overcome the grip of the great depression looked to their neighbor to the North New Hampshire, which had recently legalized pari-mutual wagering and were seeing a benefit from it. In a special election wagering was authorized in Rhode Island, 4-1, it was off to the races. Within a little more than two months, Walter O'Hara a textile tycoon from Fall River, Massachusetts and James "Judge" Dooley, a Providence Judge, combined forces to open Narragansett Park on August 1st, at a cost of $1,200,000. As it turned out, at least in the thirties, Narragansett Park was one of the premier meets in the country. It was located only about forty miles from Newport, where most affluent New Yorkers spent their Summers. A lot of these New Yorkers were also horse owners and many moved a horse or two to Gansett to watch them run. The horses also attracted bettors from Boston and New York, who rode the "Narragansett Special" a special train that took fans from the station directly to the track. Narragansett's signature race, "The Narragansett Special" was named after the train, but racing was not was Narragansett Park was remembered for in the thirties, it would be remembered for "the war". In 1937, the Araho Stables won four of the richest stakes of the meet on four consecutive Saturday's, this might not seemed far fetched, until you realize Araho, is O'Hara spelled backwards, and indeed Walter O'Hara's wife was listed as the owner of the horses. Somehow the Governor of Rhode Island, Robert Quinn, took exception to what had happened and "The Race Track War" was about to begin. ThinGs just kept escalating and by what was to be the opening day of the fall meet, the track was under martial law, surrounded by barb wire and National Guard Troops, the main entrance was protected with sand baGs and a machine gun nest. Needless to say no one showed up and the meet was cancelled. The eventual winner would be Judge Dooley. Both men were ruined in their stubborn battle. O'Hara was ousted as president of Narragansett Park after shareholders took a bath, when the 1937 fall meet was cancelled. Quinn was defeated for Governor in the next election over the fiscal burden he had put the State under, by calling out the National Guard to quarantine the track. James "Judge" Dooley took over as president of the track and held that post till his death in 1960. During the thirties the great Seabiscuit ran seven times at Narragansett, winning three times. The Forties were a period of real war for the United States but Narragansett raced on donating money to the war relief effort. During that period triple crown winner Whirlaway made three appearances at the Pawtucket oval. The first was in 1941, when he finished second in the Gansett Special. In 1942, he returned to win that same event, but a horse he was to meet in the race, Alsab, who had run second in the Derby and Preakness, but won the Belmont, was a late scratch. This caused a little uproar, as reporters speculated that Alsab's connections never intended to run the horse, and that the track held back this information, as to not hurt attendance for the big race. Whatever is was that happened prompted Judge Dooley to put up $25,000 for a match race between the two, the next Saturday. In what many considered the most thrilling race in New England Racing history Alsab gained a short lead during the mile and three sixteenth event and held on by a nose at the wire, as both horses staged a frantic stretch drive. In 1947 there was no running of the Narragansett Special, the only break in the thirty year history of the race. The forties were also the decade when Narragansett got some competition in it's own state, when Lincoln Downs opened in 1947. No other New England track to this date ever faced competition in it's own state from another major track, never mind in the Smallest State in the region. In 1953 Gansett celebrated it's twentieth anniversary with a "day" for Eddie Arcaro who returned for the day. The famous jockey started hi carrier at Narragansett in 1934. In 1954, Narragansett took over running the late fall meet, that had previously been run at Lincoln. Ahead of it's time Narragansett entered the information age in the fifties. Three Chicago men were caught using a radio transmitter and receiver to send betting information from the starting gate to the mutual window. Throughout the fifties Narragansett was still doing well, despite the entry of Lincoln Downs, it was still attracting top horses to the oval, but the tide was turning. The sixties didn't start off to well for Narragansett Park, Judge Dooley who presided over the track since 1938, died in December. In 1961 Narragansett and Lincoln Downs were in court over date disputes. In 1962 the State of Rhode Island finally approved night racing in the state. Tuesday racing is dropped by Narragansett as it for some reason is unprofitable. Night racing didn't turn out to be as popular as first thought, Narragansett returned to day racing by mid decade. The most telling blow was the discontinuation of The Narragansett Special after the 1963 running, won by Gun Bow. The decade closed out with fan favorite Charlie Boy being interred in the track infield. It was becoming quite evident that Narragansett Park would not last another decade. The seventies open up with an all out war for the racing dollar in New England. Narragansett runs in direct competition with Rockingham and Suffolk Downs. Besides competition Gansett had to deal with labor issues in 1971 they lost dates to a mutual strike, and in 1972 they halted night racing and went back to days, because grooms wanted more money to walk horses. On top of all that there was a race fixing scandal uncovered which involved Narragansett Park. In 1975, another labor issue delayed the season opener by a month. Then in 1976, the State tried to get Lincoln Downs and Narragansett Park to merge, the Governor had his sights on the Pawtucket oval as an industrial park. Just about when it couldn't get worse, a barn fire broke out in March of 1976, killing 28 horses. In May of 1976 Narragansett Park, asked and was granted permission to end their meet early. Everyone thought this was the end of racing at the Pawtucket Oval. Horse racing did end, but it ended at Lincoln Downs, after that the State agreed to give Narragansett a larger percentage of the take, to salvage the industry in Rhode Island. The plan worked and in October of 1977, Gansett, was up and running, soon after that night racing returned to the track, but was it too little too late? In November the State wasn't too agreeable to the idea of Sunday Racing, which the track said it needed to survive. On Labor Day of 1978 it finally ended, sometime in the late afternoon long time New England Jockey. Phil Ernst, guided Open The Gap, to the winners circle for the last win photo ever taken at Narragansett Park. If you took the cover off that final program you would probably think you at the Northampton Fair, not a glorious finish for a track that hosted the likes of Seabiscuit, Whirlaway and Alsab to mention a few. It's doubtful that you could get a haircut or shoe shine that last day, but what would you expect from a New England Track that served Manhattan Clam Chowder in their cafeteria. Unlike Lincoln Downs, I do remember my first trip to Gansett. I was home on leave in the fall of 1966, a buddy got wind of a hot horse that night at Narragansett. It was already late when we started the two hour drive. I remember we got lost and drove by Tasca Ford, it stuck in my head because there were always radio ads about their drag racing car, for a local drag strip. Anyhow we made it just in time for our race which was the last, we were not disappointed, In Fettle, Richard Bruno up won easy and paid seven dollars and change, a good start for Gansett. Over the years it wasn't that easy, but there were some good days. My first handicapping experience with the ole Kelco Calculator, was at Gansett. It was the first time using it and there was a play on the first race, a 15-1 shot in the morning line named Hi Sailor. By the book, I played $5 across the board. The gate opens, Hi Sailor is now at 35-1, soon after the start Joe Fabiano takes him to the lead and never looks back. Wow! this is easy I can quit my job. Then there was that announcement, and numbers started flashing, there was an objection. Worst case I still get place and show money on a 35-1 shot, not so fast the favorite who finished fourth was claiming the foul, I'm not gonna get a dime. Turns out the judges kept my horse up, but unfortunately the Kelco was just a fluke, I kept working. Speaking of the stewards, I played a race one Friday, I don't remember the horse, but George Trenger was the jockey. It was a three horse battle to the wire my horse ended a head back in third. This time after the race all the numbers started flashing, a look at the replay showed that nearing the wire the inside horse came out, the outside horse came in and sandwiched old George. The stewards agreed and he went from third to first, these guys were stewards on steroids. It was around that time that these guys actually took down three horses and made the fourth horse the winner. All in all I have some good memory's of that run down, big pale yellow building. A few years after Gansett close a fire burned down the clubhouse, and the grandstand got its front chopped off and some junk store took it over. Even more bizarre some of the escalators are still there (they don't go anywhere) and the old odds board that I would stare at as the minutes counted down to racetime, wondering if I would get shut out. We'll mister Governor how did your plan work out, it looks like a bigger pit than when it was a racetrack, even the junk store has gone out of business!